The chickens have lived full time in their mobile coop for 6 months and we are quickly approaching winter. While I know that winter can be stressful in many places, here in the south the winters are pretty mild. 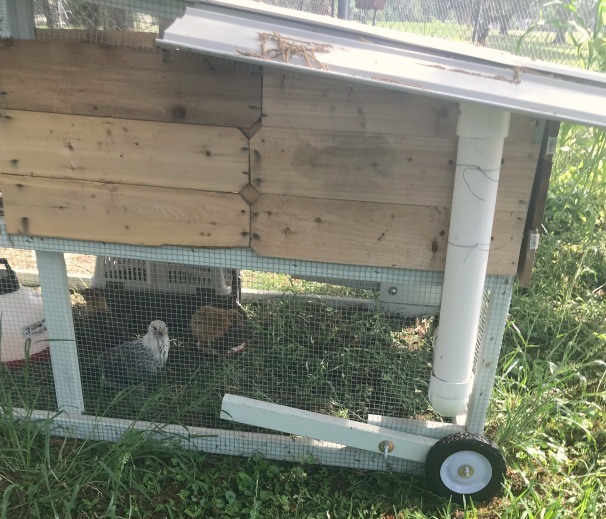 This post is about what I have learned in having a chicken tractor. While the ladies seem fine with their small group (4 Easter Egger hens) I would hesitate to add more. Not because the space is too small per se. They have the ability to move around, flap up and down, cozy nest boxes and fresh grass and bugs everyday. The reason I would not add many more is because they tear up an area quickly. In order to not have my yard full of shallow holes I have to move them daily or every other day. More chickens would make that worse. Since have access to the ground, when its dry, they use it dust bath. During the late summer, the pecan tree is fully leafed out and the shadows over the yard are deep which makes grass difficult to grow. During this time, I let the area go to a variety of weeds which they happily eat. In late October, I begin planting the annual rye which will fill the backyard with lush green grass through the winter. More chickens would consume the grass and weeds faster. You can see in the picture the brown area where they are, before a move, and the green outside the tractor. The beginning of fall here in Louisiana has brought plenty of rain. Because they have no permanent flooring, the yard can get pretty wet, up to a couple of inches in some areas of standing water during the rain. When this happens, I have to be careful where I place the tractor. During a recent large storm I moved them to the concrete slab that is part of the driveway (no garages here) then placed several inches of shavings to help keep them off of the water until it subsided. 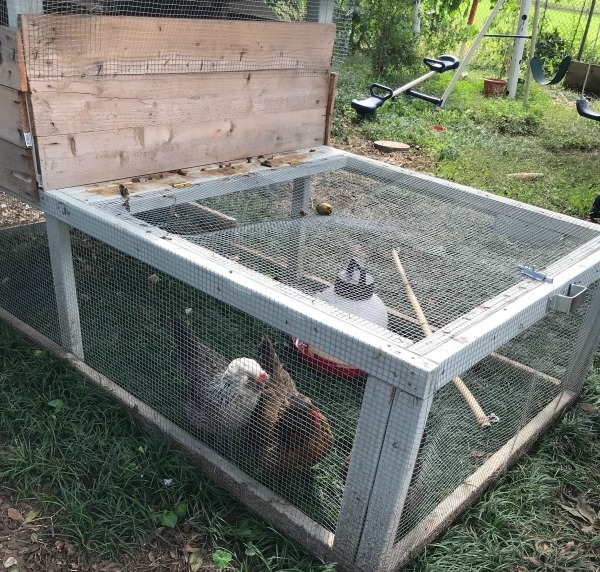 Due to the size and area of tractor (4 ft X 8ft) I was able to put part of the coop on a grassy area and the rest on the concrete with bedding. This worked out great, though the girls are wary of new things. One of the storms caused a large pecan branch to fall on the tractor! I didn’t take a picture but it partially crushed the roofed and ruined the main door. Despite this, it held up well enough to keep them safe (they were dry and unharmed) and contained. At over 100 lbs, I moved it off the roof and did a quick fix in the dark then the next day was able to put it back together. I am happy that this design is strong enough to hold up to even a branch! There are all sorts of lists on what you can and cannot feed chickens. 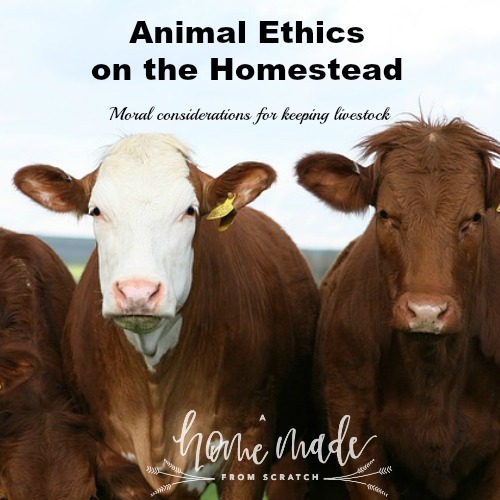 However, if they free range or live in a tractor they will experience a variety of weeds, some they like and others they do not. Since I am not feeding it to them they have choice and generally make good calls on what is ok for them. 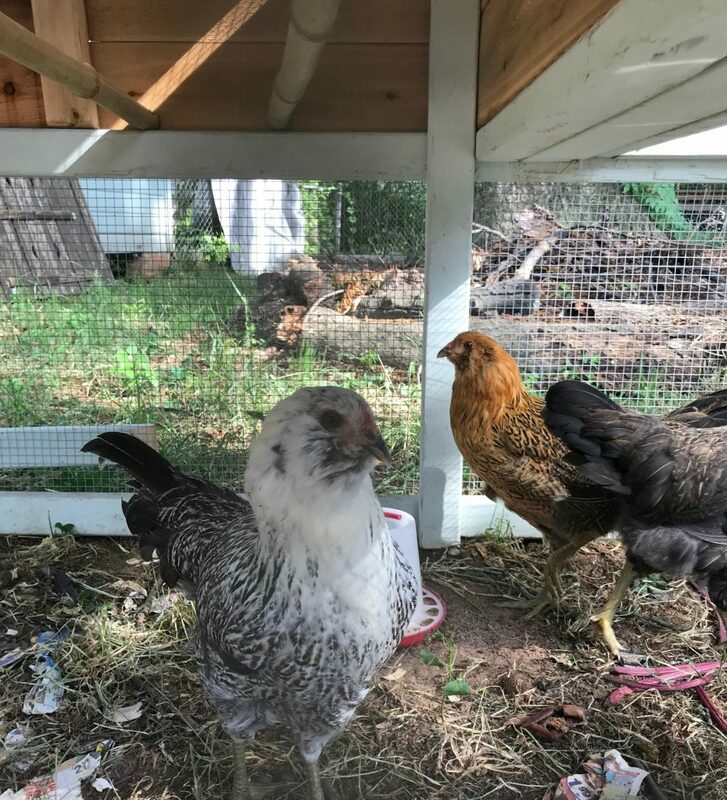 I do feed them kitchen scraps and cherry tomatoes from the garden as well as regular chicken feed. They have even enjoyed a SCOBY! Be sure to look into what type of cover crops also make good chicken food. Annual rye is one of them but there are others. Luckily the tractor is not hard to move. There is a little bit of a learning curve with the way I did the wheels. I had to install a latch later to be able to move backwards and forwards with this wheel system. If I had to do it again, I would have bigger wheels, preferably with inflated tires instead of those I have now. One disadvantage is that the chickens figured out pretty quickly how to get out of the tractor when I moved it. I tried a towel for a while to keep them in but it did not work for long. Since then, I simply find some great treats and call them back in once its moved. They get a little free time in the yard before tearing up my garden. However, because they get out, I always have to have the dogs put away while I move the tractor. Thankfully, due to the lack of a floor, cleaning is not too hard. The edges of the wood get muddy or dusty regularly but I do not have to have any kind of specific coop flooring. Only in the nest boxes I have pine shavings, which I do clean out either once or twice a week. The roosts get muddy and poopy but it takes time and is easy to wipe off since it is bamboo. Even though there is no floor, I need to do a good cleaning of the roof, roosts and next boxes every 3 to 6 months. During the clean, the ladies are free to be out in the yard. It does take at least an hour to scrub down the different surfaces but thats not too bad. The poop they leave behind is designed to help the yard. I have been trying to spread compost or lightly work in the top half inch or so with a rake in order to not have kids or pets tromp around in the poo area that tractor has just vacated. So far no real problems because they move so frequently there is no build up. The feeder is attached to the tractor but is easily detached for cleaning. Since I live in Louisiana, it does get pretty hot and I did notice the heat made them slow down a little. I would go out after work, around 5pm, and find them all panting (which is how chickens “sweat” to relieve heat). It looks concerning but is a normal part of dealing with the heat. There were a few days of 100+F which was harder on them and I did get a few cooler treats such as watermelon. However, despite my cursing of the pecan trees and their excessive branches and leaves, they do provide excellent shade. During the hottest days it is very easy to just move the coop to the shadiest part of my yard. This will be our first winter in the tractor. We live in zone 8b, in Northwest Louisiana. The lowest it has gotten in the five years I have lived here is 17F (as the low) and during the day 25F. We do not generally get ice storms, but occasionally hail, usually only once a year at most. We do get a light snow, usually not even measurable, again once a year and the wind coming off of the golf course can be a little drafty. The plan for winter is to put plastic sheeting around the area by the food and nest boxes to help with drafts. I do not plan to have any additional heating or lighting during the winter but will definitely provide extra calories such as suet cakes and scratch. 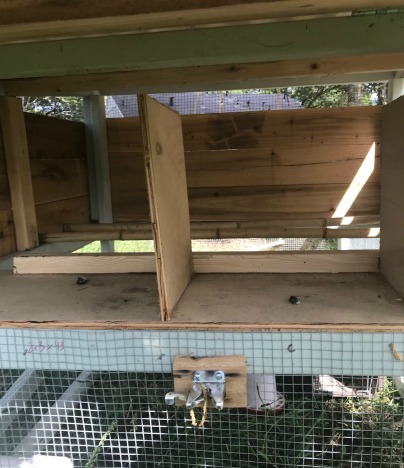 As you can see in the picture, the night roosts are open to the air day and night and I will monitor whether any additional panel should be added to help them during the winter nights. They tend to sleep together and the winters are mild so I am hoping they will not be too stressed. That’s the update on the chicken tractor! If you use one, especially if you use one as a permanent home, I would love to hear from you! Any tips appreciate. You can find me and others at the Simple Homestead Hop & Simple Life Mom! 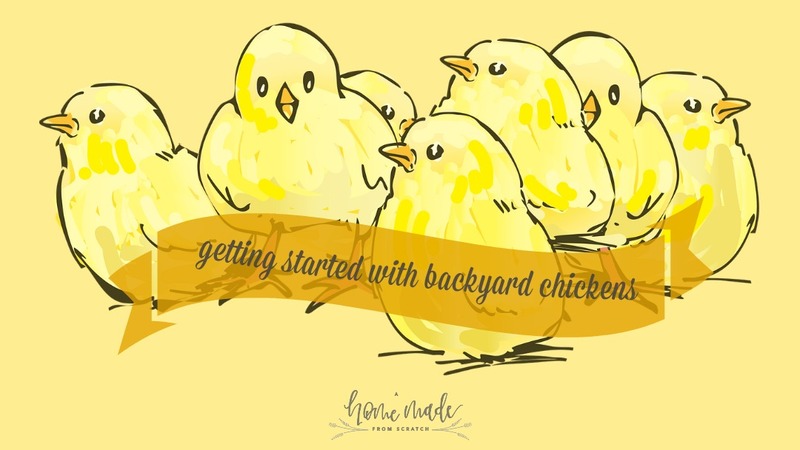 Getting Started with Backyard Chickens How to Build a Chicken Tractor Animal Ethics on the Homestead Should I get backyard chickens? Nice! 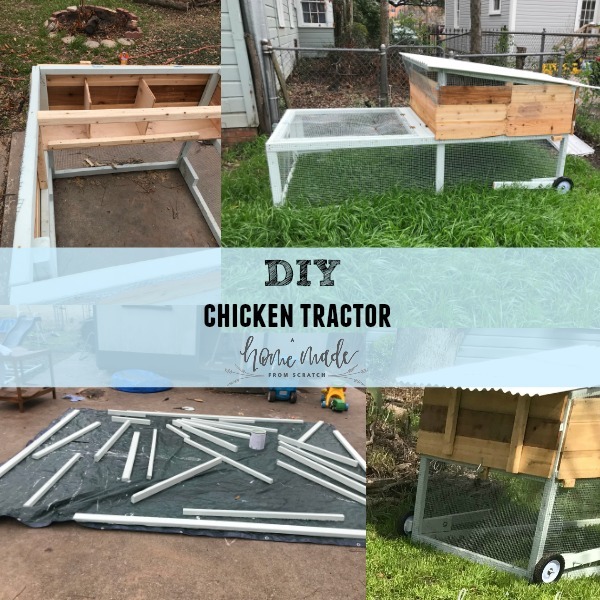 I may try a chicken tractor like that next year for the meat birds. I’m in Massachusetts so I want to over winter layers in a coop. I do have a tractor, but without a vehicle, I’m just not strong enough to move it myself. Thanks! I am debating making another for quail or meat birds. I will definitely tweak the details more next time! Thanks for the input!